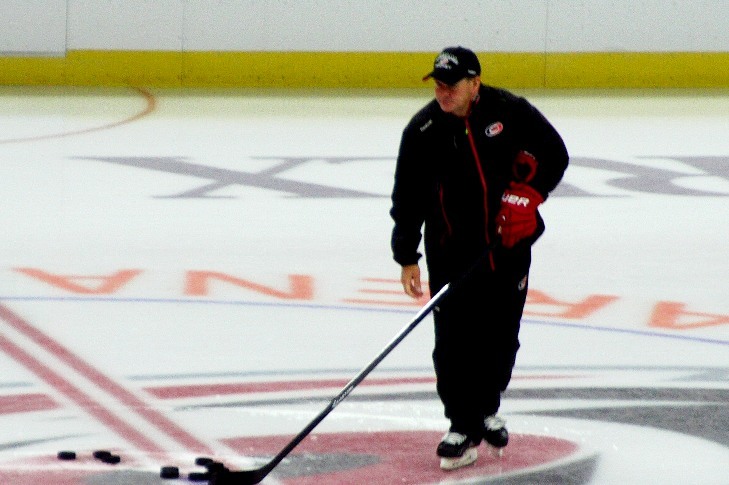 LOS ANGELES, CALIF. – Following a 3-0 loss to the Los Angeles Kings at the Staples Center on Friday, Carolina Hurricanes head coach Bill Peters wasn’t sure which way the team’s power play would continue. While outshooting the Kings 40-28, the Hurricanes were unable to get a puck past goalkeeper Jonathan Quick. It was a commendable effort, but one that still couldn’t finish with a goal. It further pushed down the team’s power play percentage number to 6.9 percent – 29th in the NHL – scoring only two goals on 29 opportunities during the first seven games of the season. After scoring its second man-advantage goal in a 5-3 win over Detroit, Carolina’s power play has gone dormant (0-13) in its last three games – a 4-1 loss to Washington, a 1-0 win over Colorado, and the 3-0 shortfall to the Kings. “The power play struggled – it’s struggled all year,” Peters said after Friday’s loss. Unfortunately, it seems that even the coach is not sure how it will all play out. Carolina’s overall scoring is averaging only 1.71 goals per game on this young season. The scoring slump has brought the team to its lowest total in the past five seasons. Not having a functional and productive power play will continue to have this team struggle to even match last year’s overall scoring lowest total of 2.23 goals per game. Since 2011, Carolina has peaked at 2.65 goals per game but has declined since then – a downward spiral to 2.59 goals for in 2012, 2.50 in 2013, and continuing down further last season and into this one. Even a power play peaking at 18.8 percent las year, the best in five years, barely topped a two-percent improvement on the next best finish of 16.7 percent in 2011-2012. It’s all a head-scratcher, even for this coach, the third one in five years, who’s ready to starting to flip a coin on the bench to decide who will get their chance at it when each power play opportunity arises. At this point, it’s anyone’s guess on who can or will help Carolina score goals – on the power play or at even-strength .